It is good, and important, to live as healthily as you can. Things such as breast feeding (if you are able and choose to), a healthy lifestyle, hand washing and sanitation help protect people in a general way from infectious diseases. But that is not always enough. 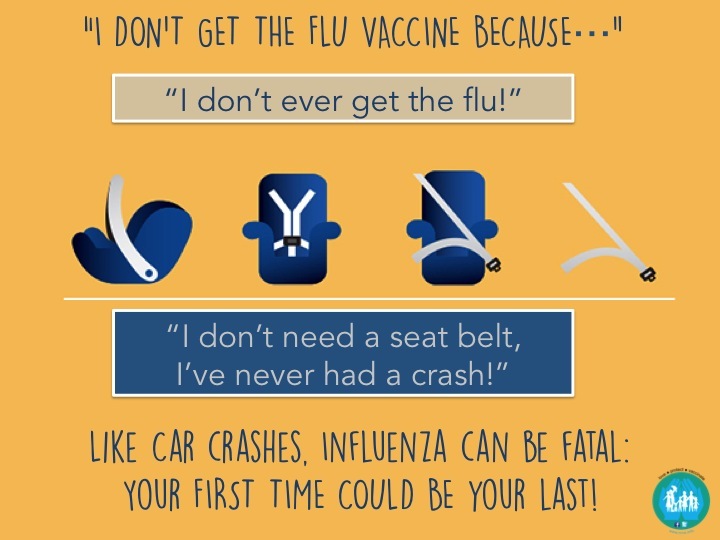 In the same way you put on a seat belt even if you’ve never had a car accident, and you use an umbrella before you get wet, you should get vaccinated to protect yourself from diseases before you get them. They are preventative medicine, not treatment. And they are not made for trivial diseases that are easy to treat – the first time you get any of these diseases, you or your family can end up seriously injured, or dead. Vaccination is the safest and most effective way to offer specific protection from certain diseases. 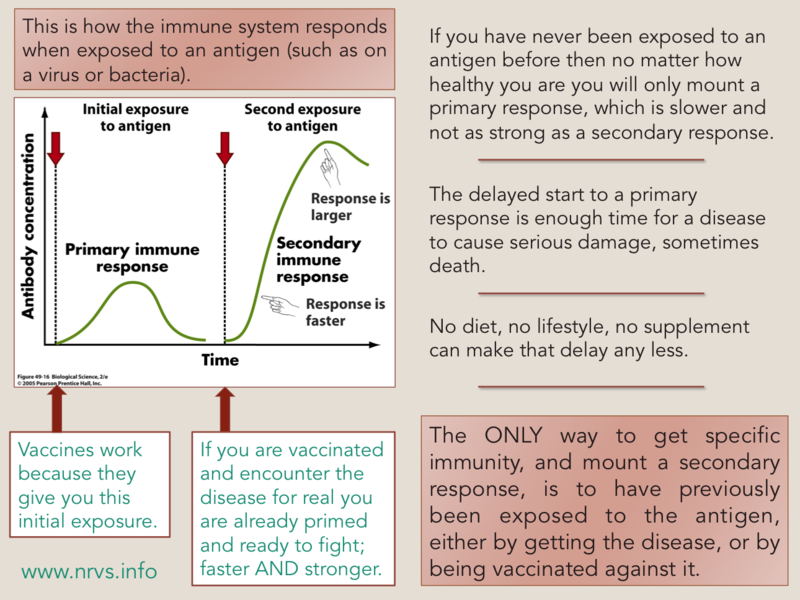 To understand why and how, it is important to have a little understanding of how the immune system works. There are 2 branches to the immune system; the innate (natural) and the adaptive (which changes and reacts and evolves according to what it is exposed to). The innate system is non specific. It includes things like the skin and nostril hair and stomach acid; barriers to stop germs getting in. It also includes some cells and chemicals in the body that help destroy germs if you get infected. BUT, it will only destroy those germs if it recognises them, and it often needs the help of the adaptive immune system to do this. Needing the help of the adaptive immune system slows everything up, and it can take a number of days to weeks before the whole system is all fired up and working at full capacity. This delay can be very dangerous; whilst your body is getting ready for the fight and making the cells to get rid of an infection, germs can already be causing immense damage. Meningococcal disease, for example, can lead to the loss of limbs, brain damage, or death in a matter of hours; the immune system simply cannot react fast enough to stop the damage occurring, no matter how healthy or strong you are. The adaptive immune system is far more sophisticated and clever. It has a number of different jobs, but one important one is how it can flag germs as being bad, and thus help the innate immune system recognise and destroy them. It also has the capacity for memory. Immune memory happens when the adaptive immune system has been exposed to a germ and reacted to it. Part of the reaction is to keep a few memory cells circulating, so that if they encounter the same germ again, the system is primed and ready to react if exposed a second time, meaning that any secondary response is not only quicker, it is far greater than the first time round. This graph demonstrates that. 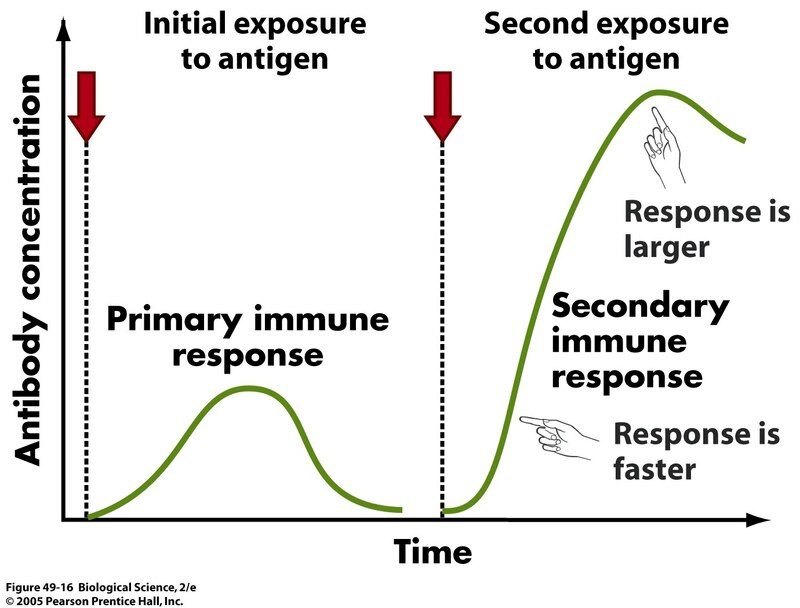 This describes how vaccines work; vaccines show the adaptive immune system enough of the germ (often just odd proteins from the outside of them, or occasionally the germ that has been rendered safe) so that it mounts a response, including generating the memory cells. That means that if the germ is encountered for real, the body is primed and there is no delay, instead the body goes straight into the strong and fast secondary response. With no delay, the germs are flagged and identified, so the cells of the innate immune system easily recognise them as being bad, and destroy them, preventing damage occuring. 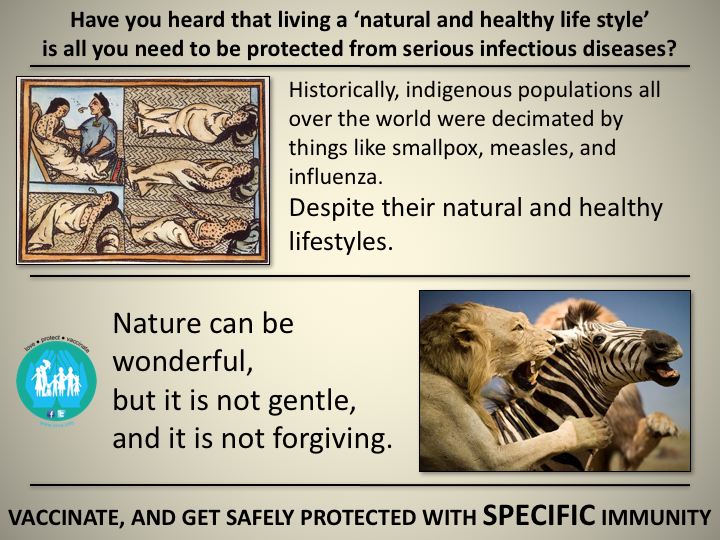 Being vaccinated leads to SPECIFIC immunity to SPECIFIC diseases. Of course a good diet and a health lifestyle can help keep you generally healthy, and it will mean that once you have recognised the germs you will be in a good position to mount a strong response, but it wont do anything to speed up the process, and it wont lead to that super strong secondary response. And it is during this delay that untold damage can occur, leading to devastating disability or death in some cases, and also means that you are able to pass the diseases on to others who might already be vulnerable to suffering severely (eg too young to be vaccinated, elderly, or unwell). The ONLY way to get specific immunity to specific diseases is by vaccinating, or getting the disease (and in some cases such as tetanus, even getting the disease is not sufficient to lead to immunity). 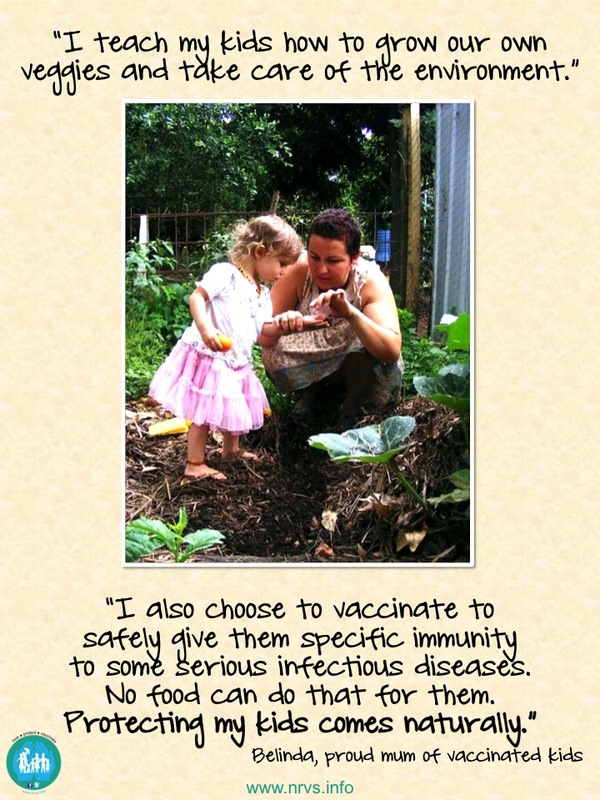 For further reading including references, please have a look at the Science of Immunisation.